Save the Date for TWM's Spring Visioning Workshop on Saturday, April 2nd! *TWM Members can bring a friend at the TWM Member rate! Thank you so much for an inspiring Saturday at the Visioning Workshop. You know I forgot how fun and POWERFUL that workshop really is. I have been looking at my collage all the time and loving it more and more each time I see it. I am so proud of myself that I could create something so strong and beautiful. In my eyes, it's perfect. My job doesn't allow for too much creativity, and I forget how much I enjoy being creative, and being able to pick up a pair of scissors and glue stick brings me back to the joys of childhood. My life will be going in a different direction soon and the college confirmed that it's the right thing to do. Thank you again for being such and inspiring diva...and I look forward to the next class with you! GET YOUR LIFE ON TRACK TODAY! If you would like to be in the loop with what Kristina is offering, be sure to check off "Seminar & Workshops by TWM Founder Kristina Leonardi" in your Subscriber Profile by clicking on the Update Profile/Email Address link at the bottom of this email. Using Your Intuition and Creativity to Gain Clarity, Find Focus and Manifest Your Dreams! Feeling a little confused with what's going on in your career or relationships? Not sure what to do next with your life? Our Visioning Workshop can help you sort it all out! Come to our popular and powerful semi-annual workshop for a creative, transformative afternoon where you will make a collage to manifest your heart's desire - and you may be surprised as to what that turns out to be. It's not unusual for participants to start new businesses, relationships, families or career paths as quickly as weeks or months after the workshop. If you are looking for both answers and results to help figure out where you are right now in your life and where you want to go next, this could be thing exact thing you need to push you forward and take you there! OUR LAST TWO WORKSHOPS SOLD OUT, SO BE SURE TO RESERVE YOUR SPOT! *TWM Members can bring a friend at the member rate! "The Visioning Workshop is a solid chunk of intense time spent thinking about what WE want and need as women, as individuals. "- Laura A. "I love looking at my collage. Whenever I look at it I feel inspired and strong, and I am reminded of the dreams I tell myself about my life." - Nicole L.
" Great! The workshop helped me to clarify what success looks like to me." - Sheraun B. Optional: Glitter, ribbon; anything else you might want to put on your collage. Water, lunch, snacks. You can also read about them on CHICKS ROCK! CHICKS ROCK! is a program of The Women's Mosaic� that provides a vehicle for women to share their experiences related to diversity and personal growth. Please be sure to visit, comment, guest blog, and spread the word! Did you travel recently? Have you switched careers? Has your culture or ethnicity or religion impacted your life in a direct way recently? Is there a personal story you've been needing to share? All of these (and more) are great starting points for a guest post on CHICKS ROCK! Writing your story can be empowering for the writer, and it also gives readers a chance to realize that they're not alone. Our stories can connect us when we need it most -- wouldn't you love to be part of that connection? So take a look at our guest blogger guidelines and the range of posts our guest bloggers have contributed in the past. Then send us an email with your story. BECOME A MEMBER OF TWM TODAY! The Women's Mosaic� is a 501(c)3 nonprofit organization that educates, inspires and motivates women to express their full potential in all areas of life by providing opportunities to connect to themselves, each other and the world around them. 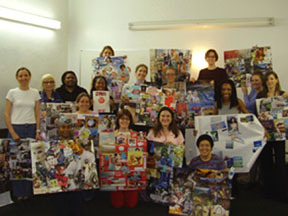 Since January 2001, TWM has offered over 95 unique activities and events that have enabled women to reach across borders and cultures, allowing them to recognize, refine and reactivate their individual and collective power and place in the world. In September 2008, we launched CHICKS ROCK!, a blog that provides a vehicle for women to share their experiences related to diversity and personal growth. For more information visit www.thewomensmosaic.org or www.chicksrockblog.com.